1. Soak the dals separately for 1 hour. 3. Combine them together and transfer to a mixie. 4. Add coriander seeds, green chillies, dry red chillies, curry leaves, salt and asafoetida. 5. Add a little water and grind to a coarse batter. 6. Add coriander leaves and mix well until thick. 7. Heat oil for deep frying over medium flame. 8. Make small balls of the batter and flatten them. 9. Add them to the hot oil. 10. Fry till crisp and golden brown. 12. Serve hot with chutney. 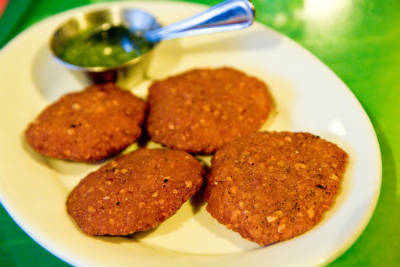 Feel free to comment or share your thoughts on this Urad and Toor Dal Vadai Recipe from Awesome Cuisine.